Hostal Garden: one of the most affordable low budget hostels in Boquete with a cozy, family - like atmosphere with 7 bedrooms and a great location. Pension Topas: conveniently located within walking distance to Habla Ya and beautifully situated besides the current of the Caldera River, it has a total of 7 bedrooms, well kept gardens, a nice terrace, a small swimming pool and a relaxed and quiet environment. Gaia Hostel: one of the most affordable low budget hostels in Boquete with a cozy, family - like atmosphere with 4 bedrooms and a great location. Still can't make up your mind? Check out this blog post about our favorite low budget lodging options in Boquete, Panama... Only Habla Ya Spanish Students are eligible for the special rates for extended stays that appear on this page when they make their reservation through us. These special rates are offered to our students due to the amount of traffic that we generate for these hotels. Most of our recommended lodging options are located within walking distance to our Spanish school in Bocas del Toro (from 1 to 15 minute walks). If you're really on a budget but still want to be in a nice and cozy place within walking distance to our Spanish school, you can't go wrong with Hostal Garden. 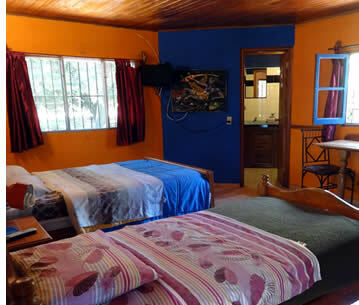 One of Boquete's longest standing low budget hostels, formerly known as Pensión Marilós, Hostal Garden by Refugio del Rio has a long history of serving budget travelers who enjoy their own privacy and independence while they explore the province of Chiriqui. Although there are no meals served at Hostal Garden, you will be able use the kitchen at your own convenience (open until 11 pm) to prepare all of your meals, and enjoy free coffee and tea. Hostal Garden also has a nice dining area with stoned walls and rustic wooden tables and chairs, where guests can enjoy their breakfasts, lunches or dinners, or simply relax and watch TV in the adjacent living room. 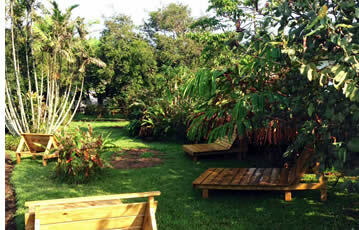 The huge garden is furnished and is a great place to take a seat (or hammock) and relax. Free wifi is also available. 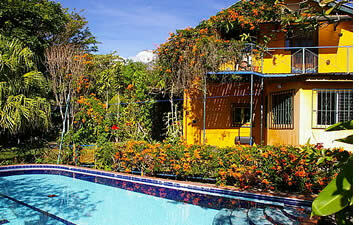 Hostal Garden definitively has a cozy, family - like atmosphere as most of Boquete's most traditional houses do. This charming building has 7 rooms, some of which have shared bathrooms while others have their own private bathroom. The largest bedroom is a dorm room that can accommodate up to 6 guests (bunk beds). The other rooms are private ones either with shared or private bathrooms and can accommodate from 2 - 4 guests. All of the facilities are cleaned daily. 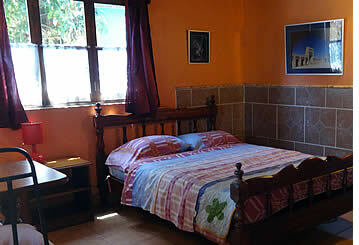 Pension Topas is a family owned budget hostel conveniently located just out of the center of town, allowing you to enjoy a quiet and relaxed environment but still be within a 5 minute walk to downtown Boquete and Habla Ya Spanish School. 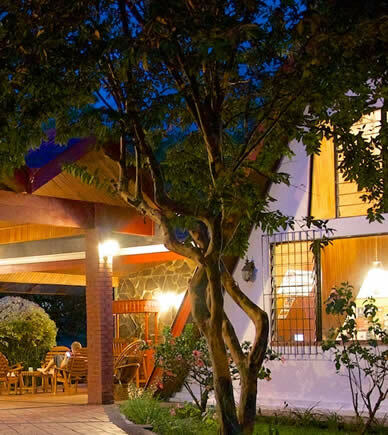 Once you walk through the main entrance of this hostel, you start feeling the peace and serenity that comes from a well kept garden in Boquete. The hosts at Pension Topas are the Schoeb family from Germany. Having been in Boquete for so many years they have a handful of tips about what to do, and their natural efficiency doesn't hurt anybody's stay in terms of having everything well maintained, clean and in working order. This hostel has a total of 7 private bedrooms. 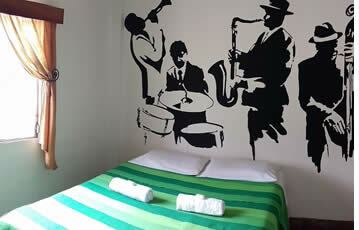 The rooms are basic but clean, ample enough and nicely decorated with a retro european feel. 5 of the rooms have their own private bathrooms with hot water and can accommodate up to 4 guests each. The other 2 bedrooms share a bathroom between the both of them. A shared kitchen is available for all guests. In the outdoor area, there is also a small swimming pool for you to enjoy the sunny days of Boquete, and a nice terrace for guests to have a cup of coffee, eat breakfast (at an extra cost), or simply check your emails thanks to their wifi internet connection. Each morning by the river side garden you can enjoy a complimentary cup of coffee to help start your day off. To reach Pension Topas: from main street, walk across the Central Park in direction of "El Municipio", then turn right, and keep walking straight past the police station, cross the block, then walk pass the "Machu Pichu" restaurant, pass another block and walk until you see the colorful sign of Pension Topas. The entrance will be on the left side of the street. We recommend Pension Topas to those who like a nice, basic and quiet setting but close to our school at a low cost, and a cozy atmosphere. Hostal Gaia is situated in the heart of Boquete, at only 5 minutes walking distance from our Spanish School at Los Establos Plaza and near all the bars, restaurants and shops/supermarkets of Boquete. Gaia is a small cozy hostel with a calming stream at the back of the property, which unites the perfect conditions if you're traveling on a budget, while living in new, comfortable and relaxing facilities. The small size of this hostel makes it easy to socialize with other travelers and Spanish students, and gives you the feel of living in a shared apartment or house. Moreover, it has the same amenities larger hostels offer, only that you do not have to share them with as many people! The pleasant atmosphere and friendly staff make it even more enjoyable to stay there, and will answer any question you may have about Boquete and its surroundings. Gaia has 2 dorm rooms that can accommodate 4 and 6 persons, and 4 private rooms for 2, 3 or 4 persons. The private rooms are arranged accordingly: one with a double bed, one with a double bed and a single bed, one with a king bed and a single bed, and one with two double beds. Each room has its own bathroom inside and all the bathrooms have hot water. The beds are new with semi-orthopedic mattresses, bed linen, pillow and blankets. The fact that Gaia is on a side street will guarantee a good quality night sleep as you'll not have to hear traffic or party noise coming from the town center. This is another advantage if you're studying Spanish during your stay - you'll be able to enjoy the calm and do your homework (if that is what you wish to do), or simply sip on some of the free coffee they offer, hang out in the social area, surf the net thanks to the free wifi connection, play board games with fellow students/travelers, or cook a nice meal in the fully equipped kitchen and enjoy it in the spacious dining room. Gaia also offers a free parking space, as well as laundry facilities and a camping area if you would like to make your Boquete experience a bit more adventurous. 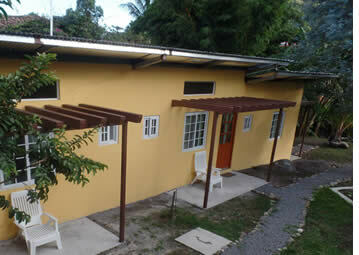 How about Hotel Occupation Rates in Boquete Panama? During Panamanian Holidays and Long Weekends it can be very difficult to get a hotel room in Boquete if you haven't booked it in advance. The months of November through February tend to have a very high occupation rate and room rates per night sometimes increase during those months of the year. Isla Verde Panama for example, are so popular, that if you don't book them with a couple of months in advance, you might not be able to stay at those places for the entire length of your stay. If you want to secure a spot at Boquete's best hotels we highly recommend that you make your reservation as soon as you have made your plans to study Spanish at Habla Ya Language School. When you decide to stay at a hostel or hotel remember that it's very likely that other foreigners will be staying at your hostel or hotel as well. Always keep in mind that one of the goals of your language travel vacation is to learn Spanish, so make sure that you don't give into only interacting with other travelers: get out there and meet some locals, do your homework and participate in Habla Ya's free extra activities. Don't miss out on these valuable opportunities to keep practicing your Spanish after classes.